This new 4-cabinet GatesAir ULXTE-100 provides 62.7 kW TPO. Photos courtesy GatesAir. Phase 2 ends the day after the 2019 NAB Show closes. The question now becomes, will TV stations in the nine remaining Repack Phases be completed on schedule? Nearly 800 days have passed since the FCC announced its TV Repack Phase schedule. Approximately 204 stations in Phases 1 and 2 have successfully repacked. Phases 3-10 include approximately 846 stations to repack in less than 18 months. Dielectric and other broadcast representatives attended a January 31 meeting with the FCC Incentive Auction Task Force and Media Bureau to provide an update on repack site completions. The meeting followed an October 2018 meeting where Dielectric presented data indicating tower crew concerns about timely completion of main antenna installations. The results of the late January FCC meeting were clear. “The FCC will be flexible in considering STA applications, and extensions if justified, potentially allowing more stations to use interim antennas to meet phase deadlines,” said Dielectric VP and GM Keith Pelletier. About two weeks after the FCC meeting, The Broadcast Bridge had the opportunity to interview Pelletier and Ray Miklius, GatesAir TV Products Group VP and GM. When the FCC announced deadlines for all Repack Phases on 4/13/17, every station knew its station’s repack deadline. Phase 1 ended 596 days later. Phase 2 ends 133 days after that. Phases 3-10 last between 5 and 13 weeks. “We see potential for a serious bottleneck in Phases 3 through 6,” Pelletier said. This 3-cabinet GatesAir ULXTE-80 makes 50.1 kW TPO. Note the liquid cooling lines above the cabinets. “Phase 3 is where it starts to grind. Phases 4, 5 and 6 are tight in timing. It looks bad, but Dielectric looks good and is not a bottleneck. It comes down to qualified tower crews. People are bringing in crews from other parts of the world but in most cases it’s too late to qualify them on tall TV towers,” he said. “We just booked our 705th antenna. Our sales team right now is focused on Phase 7-10 and wrapping up late phase orders. Antennas for Phases 3-6 are on order. There might be some stragglers but about 95% have placed orders,” Pelletier reported. “Some stations are looking at something lighter for a temporary antenna. Not a lot of are looking at temporary channel sharing agreements,” Pelletier said. “TV stations and their consultants should critically evaluate their progress towards meeting phase deadlines now and, where appropriate, seek approval to use and install interim antennas,” he said. Cooling the liquid for the 50.1 kW ULXTE-80. “GatesAir has tripled the number of transmitters it builds and sells each year and the company is getting orders locked in with enough lead time. In Phase 1 everyone made their dates. So far, Phase 2, 3, and 4 customers are keeping up,” Miklius said. The company has “20 crews doing transmitter installations and commissioning. The most common problem is that when we ship a transmitter, the electrician hasn't done the job when the installation crew arrives on site. In addition to electrical issues, tower crews have had winter weather delays, and the lead time on filter orders and detuning in transport have been the toughest delays so far,” he said. GatesAir has discovered that bandpass and harmonic filters can be knocked out or alignment during shipping. “When field installers sweep new filters, they are finding not all are in tune,” Miklius explained. “The result is that installers have learned how to field-tune filters from the filter manufacturer. An installer will test a new transmitter on dummy load, but customers want them to return and proof the transmitter after antenna is installed. Some crews sit in hotels and wait for antennas, so far keeping up, making sure these rigs are ready to go,” he said. GatesAir has shipped nearly 250 repack transmitters and performed 85 installations, some with the previously mentioned on-site timing coordination issues. “The company has many of its most senior people in the repack group. They audit the site survey, interview the customer, and try to avoid surprises upfront so everything is right. Team gets good kudos from the factory and customer installations. Our upfront effort is paying dividends for us and the customer,” he said. What transmitters are customers buying? “The middle of the TPO bell curve that we’re shipping is 42KW pre-filter. The highest power we’ve shipped is 110KW. Customers buy transmitters with TPOs from 4KW up and they seem to prefer liquid cooling. The air/liquid cost of ownership breakeven point is about 4KW. 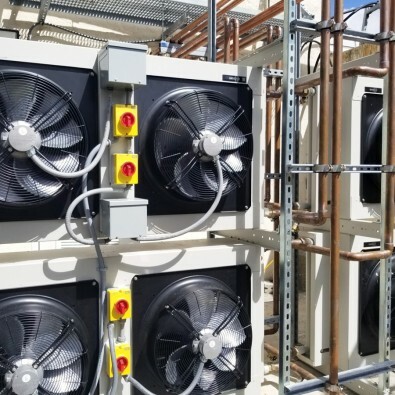 Transmitters below 4KW have a slight benefit from air cooling. Above 4KW, liquid cooling makes sense. New transmitters are the 6th generation of liquid cooling, but some stations still prefer air,” Miklius shared. 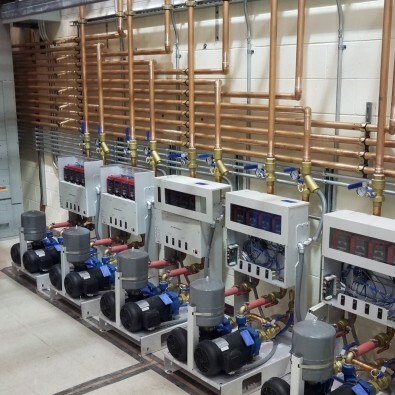 The copper plumbing in a liquid-cooled transmitter building is more than RF waveguide. Two years ago, GatesAir installed a new frequency-agile Channel 49 KRBK 5 kW SFN transmitter in the KOLR transmitter building. Today it's the Channel 22 standby transmitter. Shown, GatesAir installer Carl Williams. I was the contract transmitter engineer at KRBK FOX in Springfield MO, formerly Channel 49. Springfield MO was in Phase 1 and I helped private owner Ted Koplar sign on his first KRBK transmitter, the cheapest transmitter he could buy. The station later went SFN by adding similar cheap transmitters across the market. They were great job security. Ten years later, I permanently signed off all the KRBK Channel 49 SFN transmitters one month before the Phase 1 deadline. KRBK decided to abandon the SFN because all its market competitors transmitted from the same geographic antenna farm, where all outdoor TV antennas in the market point. During tower leasing negotiations for space in the antenna farm, discussion quietly turned to Nexstar purchasing KRBK. 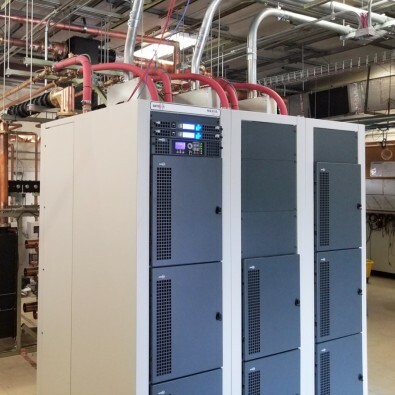 At the same time, KRBK had ordered a new GatesAir ULXTE-80 transmitter for Channel 22, a new Dielectric filter, antenna and waveguide and scheduled installation on NexStar’s KOLR 10 newly-upgraded 2000’ tower. When the Repack schedule was first announced, KRBK’s owner and managers openly wondered if Phase 1 would be a good or bad thing. Heading the repack line with 596 days lead time was the best thing that could have possibly happened. All the manufacturers and crews the station dealt with were knowledgeable, fair, organized, and prepared not to be swamped. Every action occurred on schedule as expected, with one slight exception. The exception was that about the time the new 50 KW TPO GatesAir transmitter signed on KRBK Channel 22, Nexstar bought KRBK. The sale closed and the station moved to Nexstar’s facilities with 30-day notice to everyone. The KRBK transmitter and antenna were already on the air on their property. The moment the sale and notice were announced, all the repack luck everyone at the station was celebrating suddenly shifted to the owner. The owner bought an expiring CP, took the risks, made it happen, sold it without a broker and earned a handsome profit. It's every station owner's dream. The fat lady sang for the last time ever on Channel 49 in Springfield MO on Halloween afternoon 2018, when I turned off all the cheap SFN transmitters. They were quickly removed and repurposed, as were more than a few Channel 49 people. There’s no business like show business, where unexpected fun and surprises always come with the territory.